One thousand years ago, superstition and the sword ruled. It was a time of darkness. It was a world of fear. 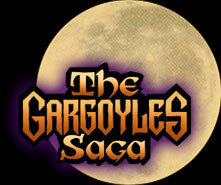 It was the age of gargoyles. Come back in time before the tragedy of the Wyvern massacre: when Hudson was still leader, when Goliath and Demona were teenagers, and the trio were but adolescents. Links To The Past - Story concept by Kathy Pogge. Written by Lex Wyvern. Published 10-8-1997. Wanderer - Written by Diana R. Flynn. Story Concept by Todd Jensen. Published 10-15-1997. A Guard's Story - Written by Christi Smith Hayden and Brian Dumlao. Story concept by Todd Jensen. Published 10-22-1997. Games Wizards Play - Written by Tas "Vince" Burrfoot. Story concept by Kathy Pogge. Published 11-5-1997. Innocence - Written by DemonSpawn. Published 11-12-1997. First Do No Harm - Written by Damien "Foggy" Tobin. Story Concept by Batya "The Toon" Levin. Published 11-19-1997. Ever Faithful - Written by Nicodemus, Aaron Ziegler, and Brian Dumlao. Story concept by Todd Jensen and Damien Tobin. Published 12-10-1997. Prince of Thieves part 1 - Written by Siryn. Story concept by Kathy Pogge. Published 12-17-1997. Prince of Thieves part 2 - Written by Siryn. Story concept by Kathy Pogge. Published 12-24-1997. Prince of Thieves part 3 - Written by Siryn, Damien Tobin, Christi Smith Hayden, Nicodemus. Story idea by Kathy Pogge. Published 1-14-1998. Dreadnought - Written by Christi Smith Hayden. Story Idea by Todd Jensen, Damien "Foggy" Tobin, and Brian Dumlao. Published 1-21-1998. The Fox Came Back - Written by Tas "Vince" Burrfoot. Published 1-28-1998. The Seduction - Written by Christine Morgan. Outline by Kathy Pogge. Published 2-4-1998. Coming of Age part 1 - Written by Aaron Ziegler. Story idea by Nicodemus. Published 2-11-1998. Coming of Age part 2 - Written by Aaron Ziegler. Story idea by Nicodemus. Published 2-18-1998. Cornerstone - Story Concept by Christi Smith Hayden. Written by Tara "LJC" 'O Shea and Melissa "Merlin Missy" Wilson. Published 2-25-1998. Destiny - Story Concept by Kathy Pogge. Written by Earl Allison. Published 3-4-1998. Alliances part 1 - Story Concept by Kathy Pogge, Entity, Joshua Whalen, and Brian Dumlao. Written by Jen Baily and Christi Smith Hayden. Published 3-11-1998. Alliances part 2 - Story Concept by Kathy Pogge, Entity, Joshua Whalen, and Brian Dumlao. Written by Merlin Missy. Published 3-18-1998. The Reluctant Hero - Written by Diana R. Flynn. Story Idea by Christi Smith Hayden. Published 3-25-1998. News From The South - Written Lex Wyvern. Story Idea by Kathy Pogge. Published 4-22-1998. Pilgrimage - Written by Kathy Pogge. Story Idea by Brian Dumlao. Published 4-29-1998. Perspectives - Written by Todd Jensen. Story Idea by Alison Wilgus. Artwork by Danzeth and Jessica Entis. Published 5-6-1998. To Every Season - Story Idea by Stephen R. Sobotka, Jr. and Anna Hansen. Written by Durid the Druid, Robby Bevard and Rahsaan Footman. Illustrations by Robby Bevard. Published 10-31-1999. Dragon's Stone - Story Idea by Todd Jensen. Written by Todd Jensen. Illustrations by Jessica Entis. Published 11-8-1999. Nowhere to Run - Story Idea by Shauntell Holm and Jonathan Cotleur, with contributions by Damien Tobin. Written by Shauntell Holm and Jonathan Cotleur. Illustrations by Shauntell Holm and computer colouring by Tony "Marlos" Teakles. Published 11-14-1999. Nowhere to Hide - Story Idea by Shauntell Holm and Jonathan Cotleur, with contributions by Damien Tobin. Written by Shauntell Holm and Jonathan Cotleur. Illustrations by Shauntell Holm and computer colouring by Tony "Marlos" Teakles. Published 11-22-1999. Only Human - Story Idea by Damian Tobin and Jonathan Cotleur, with contributions by Stephen Sobotka, Diane R. Flynn and others. Written by Gray. Published 11-29-1999. The Adopted - Story Idea by Todd Jensen with additional material by Stephen R. Sobotka, Jr. Written by Todd Jensen and Alan "Ordell" Coleman. Published 12-6-1999. Bandit's Gambit - Story Idea by Stephen R. Sobotka, Jr. Written by Durid the Druid, Mandi Ohlin and Jonathan "Entity" Cotleur. Artwork by Noel Leas. Published 12-12-1999. Change of Acquisition - Story Idea by Stephen R. Sobotka, Jr. Written by Mandi Ohlin. Artwork by Damocles. Published 12-20-1999. Equinox - Story Idea by Jonathan Cotleur, Rahsaan Footman, and Stephen R. Sobotka, Jr. Written by Rahsaan Footman. Artwork by Jessica Entis. Published 12-27-1999. Kindred Spirits - Story Idea by Christi Smith Hayden and Stephen R Sobotka, Jr. Written by Stephen R. Sobotka, Jr. and Alan "Ordell" Coleman, Jr. Artwork by Christi Smith Hayden. Published 1-3-2000. Second In Command - Story Idea by Rahsaan Footman, Anna Hansen, Jonathan Cotleur, and Stephen R. Sobotka, Jr. Written by Shauntell Holm. Artwork by Shauntell Holm. Published 1-10-2000. Serendipity, pt 1 - Story Idea by Jonathan "Entity" Cotleur and Stephen R. Sobotka, Jr., and based on material by Patrick Toman and Christi Smith Hayden. Written by Stephen Sobotka, Jr. Artwork by Christi Smith Hayden. Published 1-17-2000. Serendipity, pt 2 - Story Idea by Jonathan "Entity" Cotleur and Stephen R. Sobotka, Jr., and based on material by Patrick Toman and Christi Smith Hayden. Written by Stephen Sobotka, Jr. Artwork by Christi Smith Hayden. Published 1-24-2000. The Wedding, pt.1: Not Wisely, But Well - Story Idea by Jonathan "Entity" Cotleur and Anna Hansen. Written by Jonathan "Entity" Cotleur and Shauntell Holm. Artwork by Shauntell Holm. Published 1-31-2000. The Wedding, pt.2: Destined Hearts - Story Idea by Jonathan "Entity" Cotleur and Anna Hansen. Written by Jonathan "Entity" Cotleur and Shauntell Holm. Original Artwork by Shauntell Holm and Noel Leas. Published 2-7-2000.